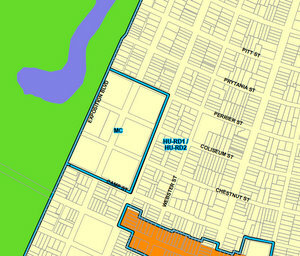 A proposed change in the zoning of the DePaul medical campus owned by Children’s Hospital could greatly expand the possibilities for commercial development in the middle of an Audubon Park neighborhood, drawing the attention and concern of neighbors and their City Councilwoman. 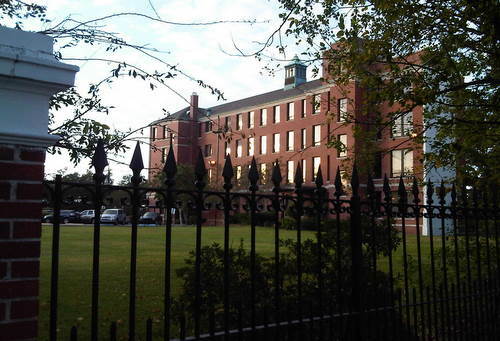 Spanning six blocks on either side of Calhoun Street and surrounded by a tall brick wall, the site of the former DePaul Hospital has been used for mental-health facilities for much of its existence since it was established by nuns in 1876. 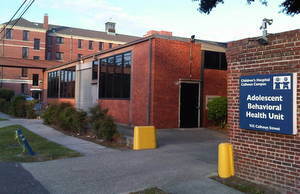 Children’s Hospital bought the property about five years ago, and currently uses one of the main buildings for a pediatric mental health facility, leases the other to LSU for an adult psychiatric unit, and has a number of other functions such as its Parenting Center in the lower-lying buildings on the campus. Technically, the campus carries the same residential zoning as the neighborhood that surrounds it. Its medical functions are allowed by a special exception that would expire if the site were to be abandoned for more than six months, and that restricts the changes that can be made to basic extensions of the services already there. The master plan adopted last year, however, envisions the property as maintaining an “institutional” land use, so when the new Comprehensive Zoning Maps were released, city planners designated the site for a new zoning classification: Medical Campus. Not only would the classification essentially ensure the site’s use as a hospital into perpetuity, but it would also allow a number of other commercial uses: a heliport, a university building, a day care center, an emergency homeless shelter or even a hotel, restaurant or financial institution. In general, the growth of a hospital can greatly change a residential neighborhood, said Jay Seastrunk, a new Upper Hurstville Residents’ Association board member who has tracking the issue. Often, it’s not even the hospital itself, but the commercial developers who are drawn to it. Children’s Hospital intends to renovate the existing buildings, but otherwise has “no long-range plans specifically for the site at this time,” said Brian T. Landry, vice president for marketing. The hospital did not request the zoning change, he said, and will be meeting with the city planning staff to learn exactly what it entails. Until then, Landry said it would be premature for Childen’s Hospital to try to state what the ideal zoning for the DePaul site would be. “It will continue to be our endeavor to be good neighbors,” Landry said. The issue formed a substantial part of the discussion at an Upper Hurstville neighborhood meeting last Sunday. Unlike the raucous debates that met some of Children’s Hospital’s previous expansion plans, Sunday’s conversation had an almost meditative tone, perhaps reflecting the early stage in the process. City Councilwoman Susan Guidry told the residents that as soon as they brought her their concerns, she requested a formal review of the “institutional” land use. Fenn French, at the meeting to pitch his Statehouse candidacy, said that he lives next to Loyola University and urged the association to protect itself against becoming neighbor to an “institutional” land-use classification. For now, the first step seems to be for Children’s Hospital to have its meeting with the city planners. At some point soon afterward, the Upper Hurstville neighbors say they’d like to meet with the hospital and the city together. Upper Hurstville: tiny organization formed just to harass certain “other” neighbors. Fenn French: Jay Batt’s good friend who hasn’t a clue about governance, politics or what it takes to be a leader in this community. Once again, why do we have to have “an association” to speak for us — what is wrong with the council person that we elected to see what is going on and move in the direction of what is right and good for the people who have elected her! It is the council person’s job to be on top of issues!